Tribes Overall: "Overall, we all had a wonderful time and yes, it definitely lived up to expectations. Thank you!!" Tribes Service: "Yes. Paul, who handled our booking, provided excellent advice and helped us plan our bespoke itinerary. He listened, understood very well what we wanted, and made excellent recommendations. All the pre-departure information was very clear and efficiently relayed. The only surprise was that our core programme didn't include a true immersion in the Cloud Forest. Once we realised this, we booked an additional activity via the local team in San Jose and had a wonderful afternoon in the Santa Elena forest. The Costa Rica-based ground handlers were outstanding throughout - friendly, incredibly responsive, and able to fix or arrange anything. All the arrangements for our private itinerary worked perfectly. All over the country, drivers and guides arrived on time, and delivered exactly what we expected." Guides: "The guides and drivers were outstanding throughout. We quickly realised that we would have seen only a fraction of what we did without local guides, and would have understood even less. Styles varied from the more extrovert and entertaining to the more reserved, but they were universally knowledgeable and hugely likeable. The drivers were all extremely friendly and personable - and safe!" 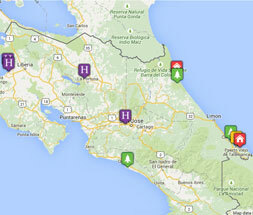 Social & Environmental Responsibility: "It really does feel like Costa Rica works. The deal is clearly that a controlled level of "eco-tourism" provides the economic motivation to preserve the wonderful forests and wildlife, without overloading the wilderness with so many visitors that they inadvertently destroy what they have come to admire. And at the moment, it works. So it is possible! Brilliant!" Smallish hotel, right on the beach in a lovely wide bay, ocean rollers as the soundtrack, large, stylish rooms (huge. comfortable beds, great bathrooms), enthusiastic, personable staff. The food is a bit up and down, and the mysterious and uncharacteristic decision to start up a club volume disco just before sunset on the Friday cleared the pool bar in seconds, but overall this was a lovely place to spend our last few days. One thing to note is that the beach is sandy and gently shelving but the waves would be challenging for small children or less confident swimmers. Very good, stylish, boutique hotel. Central, so easy to walk around the city. Good place for a first night. We thought we might need a bit of respite by the time we got to La Fortuna, so we chose a place which would be modern, comfortable, and uncomplicated. In fact, Tortuguero and Sarapiqui were so good that this wasn't really necessary. Arenal Springs is fine - very comfortable rooms, great views of the volcano from the veranda, and a range of hot spring pools. However, the Floridian designers have brought the Truman Show to Costa Rica with their rows of little houses, and allowing guests to drive their own cars - and buses - around the site is not a smart idea. This didn't have great reviews and was selected on a "best of a bad bunch" basis, but actually it's great. Large, very comfortable rooms (if a bit chilly), great staff and personal service, and a very good restaurant. It's right up in the Cloud Forest, so very atmospheric, and only a few minutes' walk up the track to the Monteverde National Park. Pretty much perfect. Just 12 outstandingly comfortable rooms along the waterfront, very good food, great staff. "So many things to enjoy. Highlights? The journey to Tortuguero, along unmade roads and then for an hour and a half by boat along the lagoon, followed by 2 days of drifting around the rivers and canals enjoying a unique environment. Walking through the Cloud Forest in Santa Elena, dreamlike and intense as the mists drifted among the dense forest. Watching a troop of howler monkeys climb trees in Sarapiqui to bed down for the night, listening to the roars as they woke up at 5.00 am, then seeing them descend while we ate breakfast. Lazing around the gardens of the Hacienda La Isla. The Pacific waves rolling on to the beach. And all those lovely people."